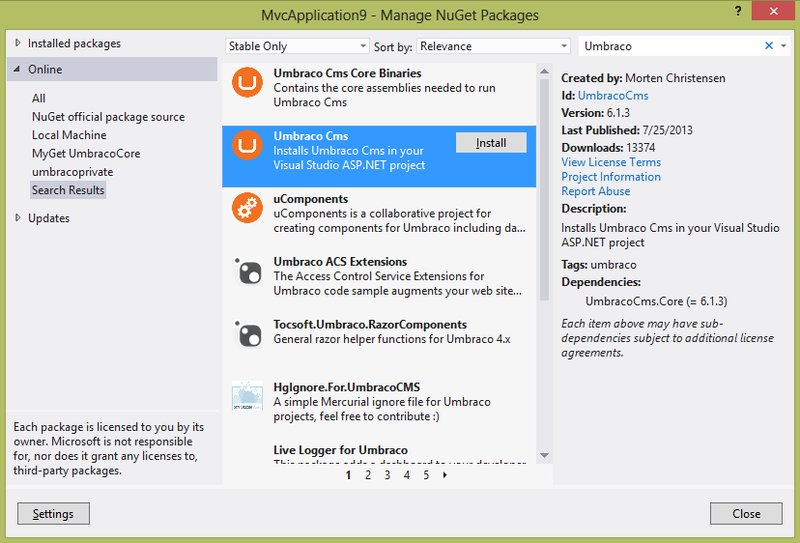 Follow these steps to do a full install of Umbraco with NuGet. We're aware of an ongoing issue with ReSharper 8 which interferes with the NuGet installation and causes it to fail (you can help getting this resolved by voting for this issue). The advise for now is when you're installing Umbraco: suspend ReSharper through Tools > Options > ReSharper > Suspend Now. After you're done installing or updating you can re-enable ReSharper in the same way. Before you start: make sure your NuGet version is up to date. We use the latest version while testing and can't guarantee that the install process works with older versions of NuGet. 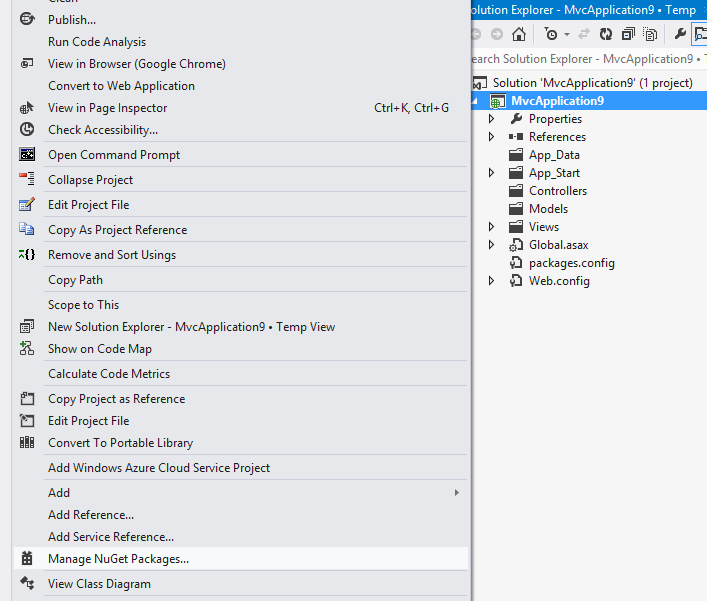 In Visual Studio, go to Tools > Extensions and Updates, then Updates > Visual Studio Gallery. 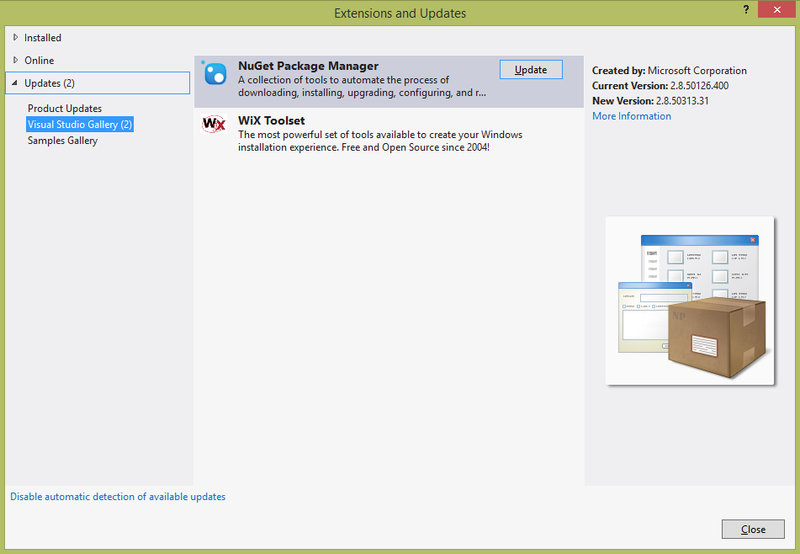 Check if there's a NuGet update available and install it. If you don't already have NuGet installed, you can read all about the installation process here: https://docs.nuget.org/docs/start-here/installing-nuget. 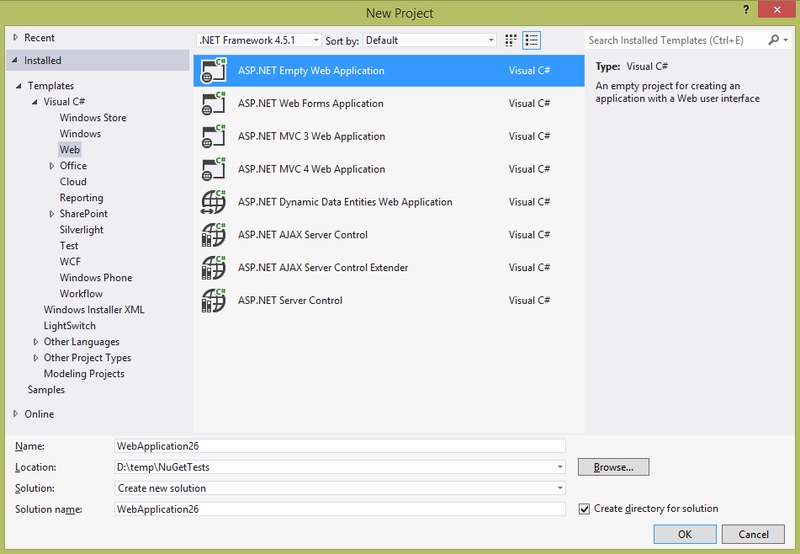 To install Umbraco we first need a Visual Studio solution. Some of these have a second step, pick the Empty template on that second step. It's important to pick only one of those as other templates cause errors beyond our control. 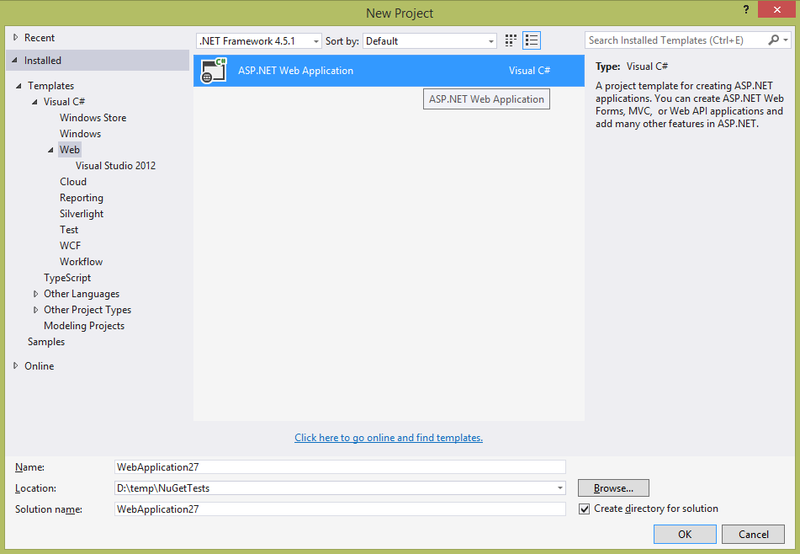 Go to File > New Project and pick an ASP.NET Web Application. Note: Refrain from naming your solution Umbraco, as this will cause a namespace conflict with the CMS itself. On the next step, select the Empty template. 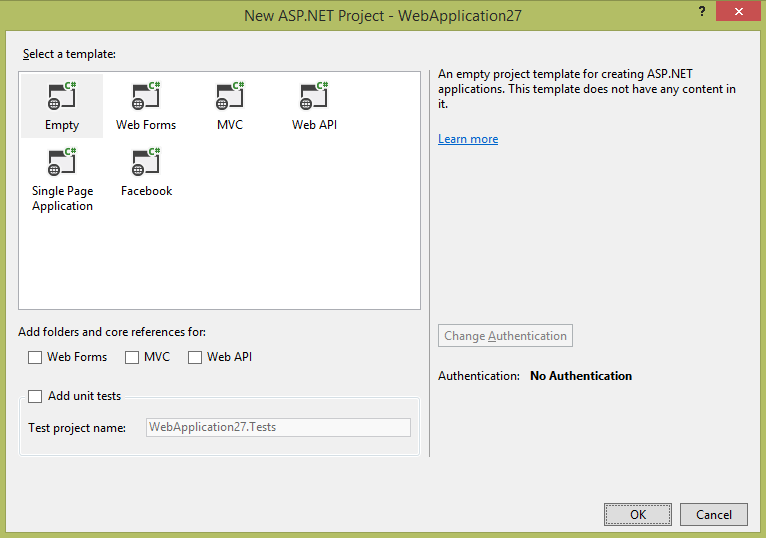 It's important to pick empty as other templates include incompatible versions of MVC and Json.NET. (Don't enable any of the checkboxes to add folders or core references. Umbraco will add them for you). Again, if there's a next step, then choose Empty to prevent conflicts. The latest release of Umbraco is always available in the NuGet gallery. All you have to do is search for it and install. 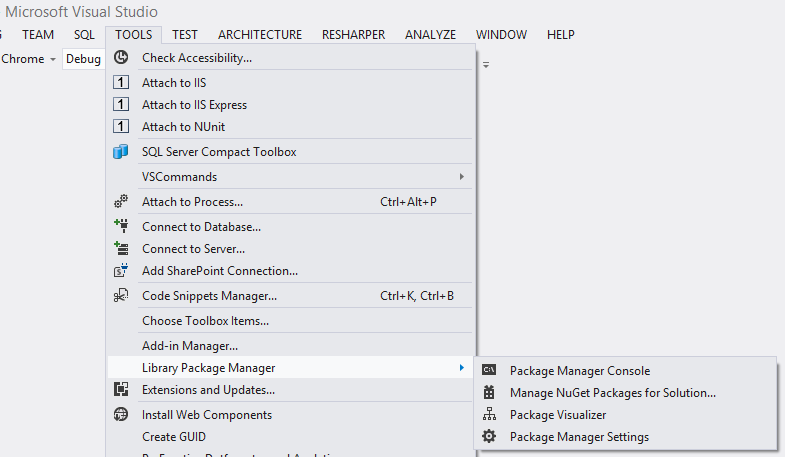 To install Umbraco from the Visual Studio interface, right-click on the new project you just made and choose Manage NuGet Packages. You can then use the search function to find the package called Umbraco CMS. You'll also find the Umbraco CMS Core Binaries package, which will be included automatically when you choose Umbraco CMS. So make sure to pick Umbraco CMS (highlighted in the image below) and click Install. NuGet will then download dependencies and will install all of Umbraco's files in your new solution. During this process it will ask if it is allowed to overwrite your web.config file. In this case, overwriting the file is safe because we just started a new project. If you're installing Umbraco in an existing project, however, you might want to create a backup of your existing web.config file before answering "Yes". You can do the exact same thing from the package manager console, which is a bit quicker as you don't have to click through the menus and search. Enable the console by going to Tools > Library Package Manager > Package Manager Console. Then simply type Install-Package UmbracoCms to start installing the latest version of Umbraco. During this process it will ask if it is allowed to overwrite your web.config file. In this case, overwriting the file is safe because we just started a new project. However, if you're installing Umbraco into an existing project you might want to create a backup of your existing web.config file before answering "Yes". 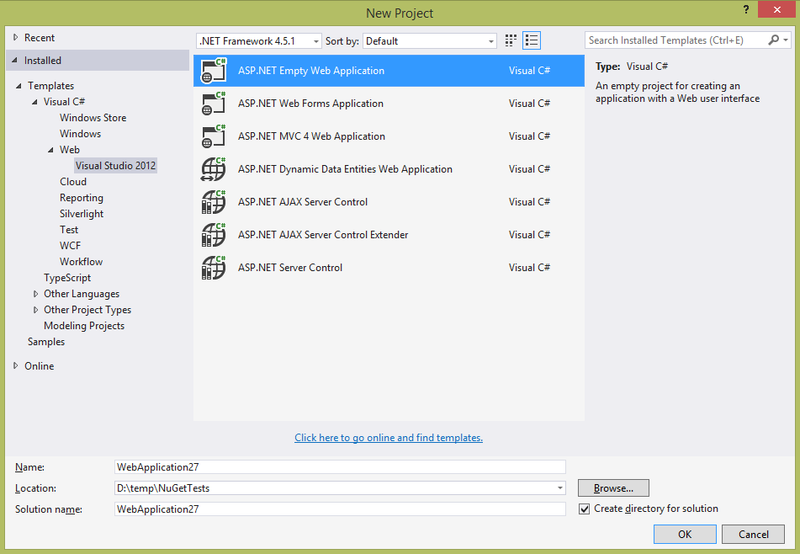 You can now run the site like you would normally in Visual Studio (using F5 or the Debug button). Follow the installation wizard and after a few easy steps and choices you should get a message saying the installation was a success. You should note that the Umbraco NuGet package adds a build step to always include the Umbraco folders when you deploy using Web One-Click Publish with Visual Studio. Should you need to exclude any of these folders or content, you can add a target to your .pubxml files in the properties/Publish folder. For instance if you need to exclude json data a plugin generates during production.